Calling all change-makers who are passionate about sustainability, challenging the status quo, pursuing big ideas, and playing their unique role! The Landscape Architecture Foundation (LAF) invites you to participate in its historic Summit on Landscape Architecture and the Future. 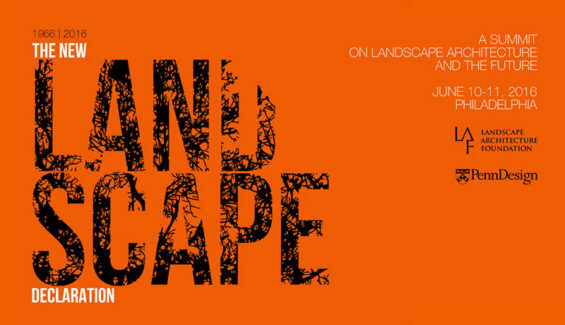 On June 10-11 in Philadelphia, LAF is convening preeminent thinkers and influencers from around the world to set the course for landscape architecture to make its vital contribution in the 21st century. Over the course of two days, an exceptional line up of 65 established and emerging leaders will reflect on what landscape architecture has achieved over the last 50 years, present bold ideas for what it should achieve in the future, and engage in lively debate about realizing landscape architecture’s potential and effecting real world change. The Summit marks 50 years since Ian McHarg and other leading landscape architects composed LAF’s seminal Declaration of Concern, which decried the burgeoning environmental crisis and heralded landscape architecture as critical to help solve it. Building on this legacy, this one-time historic gathering will culminate in a redrafting of the original 1966 Declaration of Concern and a landmark publication of the ideas presented. LAF will also host a lively dinner and reception at the Constitution Center to celebrate the 50th anniversary of the organization’s founding. Join the best minds and rising stars in contemporary landscape architecture, broaden your thinking, get inspired, and help propel the profession forward! WORLD LANDSCAPE ARCHITECTURE is proud to be a media partner of the LAF Summit.